Howard Hawks was adept in all genres of film, but it was with comedies where his talent shone the brightest. After making the successful drama Only Angels Have Wings in 1939, his next project would be the re-making of the classic The Front Page by Ben Hecht and Charles MacArthur, reworking the script into a screwball comedy called His Girl Friday. By changing the Hildy Johnson character from a man to a woman, Hawks was able to add sexual tension between the two main characters, which would help to fuel the films frenetic pace. From the opening credits to the final frame of the film the laughs come at you in rapid succession thanks to Hawks’ use of over-lapping dialogue. By emphasizing certain portions of dialogue he is able to keep the verbal onslaught from becoming an unrecognizable torrent of noise. Hawks is guiding all action, timing and dialogue as if he were the jockey on a thoroughbred going to the whip in the homestretch. This is the main strength of the film, it doesn’t give you time to catch your breath. Starring Cary Grant, Rosalind Russell and Ralph Bellamy as the principle characters, Hawks manages to cram close to 180 pages of dialogue into a relatively short 90 minutes of classic screwball comedy. Grant’s character Howard Burns is a shifty, lecherous manipulator who will stop at nothing to get the scoop on his rival newspapers, while Russell’s character Hildy is the hard-boiled veteran news reporter who longs for a more normal life with her new fiancé, Bruce Baldwin (Ralph Bellamy). Hildy is caught in a tug of war between Burns and Baldwin as each of them feel they know what is best for Hildy. This is played as the backdrop for the main theme of the story, the execution of an anarchist found guilty of murdering a policeman. It is said that comedy is the toughest form of acting, and if this is so, then Cary Grant and Rosalind Russell were robbed at Oscar time. Their timing and chemistry help to keep the helter-skelter nature of the film from becoming an out of control mess. But theirs is not the only great performances in the film; Hawks also assembled most of the great character actors of the time to round out the cast. Roscoe Karns, Gene Lockhart, John Qualen and Clarence Kolb are names that most modern day viewers might not recognize, but in the golden age of Hollywood cinema they were the stalwart contract players of the studio system, and their film dockets are dotted with most of the classic films of the thirties and forties. 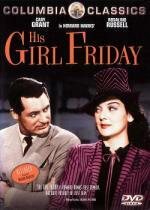 His Girl Friday is one of these true classics and should be a part of any film fans library. Another great film! As I said to Pete though when he reviewed it, I think I do prefer the not-quite-so-fast performances of The Philadelphia Story. Bringing Up Baby is another great one, but is even faster! I haven't seen this in a long time...I'll have to see if it's in one of my box sets. I'm surprised by how many Cary Grant movies I have since I never really thought of him as one of my favorite actors. I mean, come on, he never made a western...how good can he be?